It’s fair to say that getting sustainability right is a challenge for most companies; it’s even harder when you throw consumers into the mix. However, every now and then a campaign comes along that makes you sit up and take notice. Founded in 2006, the US-based shoe retailer TOMS was founded with a strong sense of giving back to communities in need. The company’s promise was simple – for each pair of shoes bought, it would donate another pair of shoes to a child in need. To date, TOMS has given more than 35 million pairs of new shoes to children in need. This year TOMS brought their global CSR campaign, which has been running for eight years, to the United Arab Emirates. 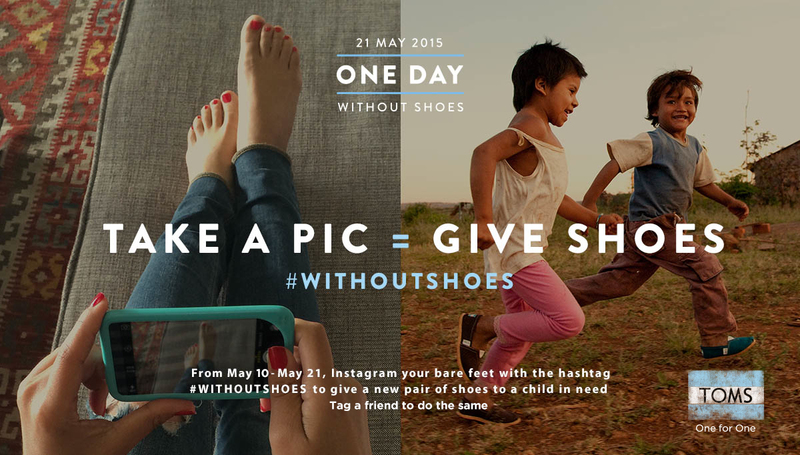 The company has taken its original premise of “One Day without Shoes”, an event where participants do not wear shoes throughout the day in order to raise awareness for TOMS’ goal of giving shoes to children-in-need, online and onto social media. The concept is a simple yet powerful initiative where they would like people to take a picture of their bare feet and share it on Instagram. With each picture shared, one pair of shoes will be given to a child in need. A simple picture tagged with #WithoutShoes can help the cause and provide a donation. As of last Thursday afternoon, more than 296,000 children will benefit from the campaign, according to the company’s website. It’d be interesting to see how many UAE consumers got involved (I’ll see if I can get a response from the UAE retailer which has the TOMS franchise, Apparel Group. The below are just a sample of the 300,000 plus images which have been generated over the past two weeks, both by consumers as well as celebrities and the media. Let’s hope other companies can learn from TOMS and how powerful a simple concept such as this can be for the brand, the consumer and for communities in need. For every picture of feet that's posted #withoutshoes @toms is donating a pair to a child in need! #noexcuses #chooselove. This entry was posted in CSR, Marketing and tagged #withoutshoes, Apparel Group, brand alignment, corporate social responsibility, CSR, shoes, sustainability, TOMS by alexofarabia. Bookmark the permalink.